The following blog post was too large to be posted on one page so it has been split into two. Please visit page 2 to view all the process and presentation work for the Salem New Town Center. The city of Salem, Oregon is the subject of my terminal design studio at the University of Oregon. As part of the Sustainable Cities Initiative, the city or Salem contacted my instructor Nico Larco and proposed that we participate in their new plan to redevelop their North Downtown neighborhood. The aerial view above shows the Salem North Downtown neighborhood as it exists today. 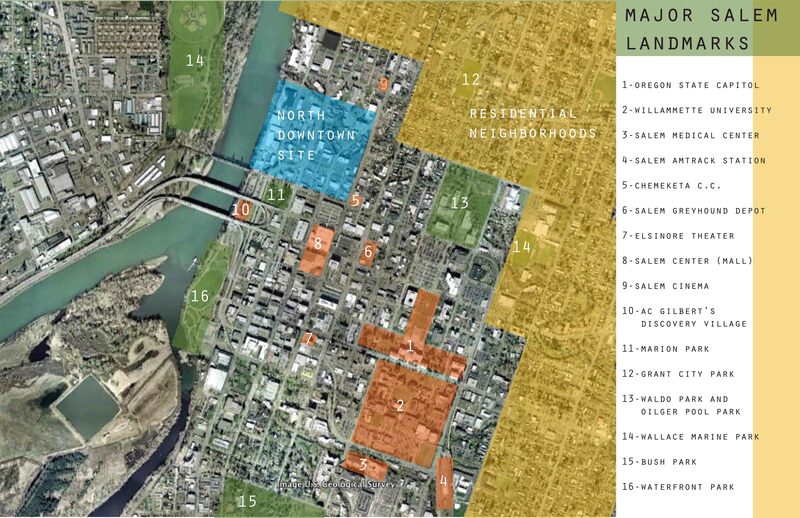 The bulk of downtown Salem is currently a thriving metropolitan center supported by the state workers at the Capitol complex (to the East), the student community at Willammette University (to the South) and several strong residential neighborhoods (to the North and South, respectively). However, the North Downtown neighborhood (located in the North-West corner of downtown) stands apart as a rather depressed post-industrial sector of the city. 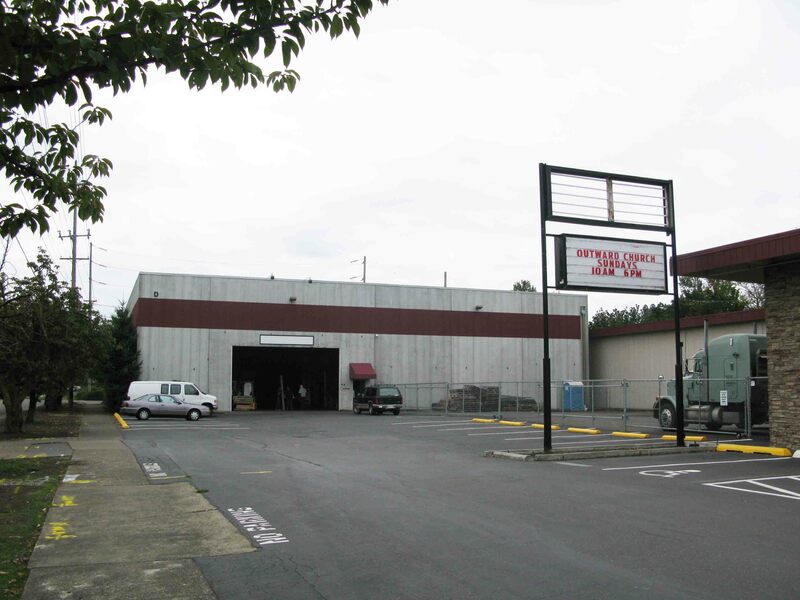 Standing on approximately nine (extremely large 400’x400′) square city blocks the neighborhood is mostly a collection of vacant warehouses, dilapidated apartment complexes, used car lots and small industrial fabrication shops. The images above give a small snapshot of the mood and feeling of the neighborhood. It has a reputation as being dirty, shabby, full of undesirable individuals and unsafe. The image below represents the current tax-lot apportioning of the neighborhood. The neighborhood also has a 150 year-old Union-Pacific rail line running through the middle of its West side. 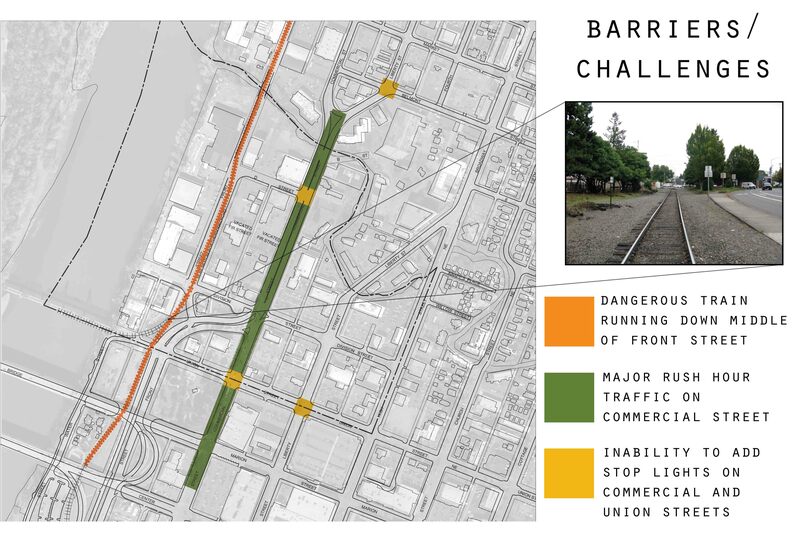 Although the rail line only serves the industrial shops on the West side of the neighborhood, and the train only comes through a couple of times a week, the public perception is that the rail creates an unsafe situation for cars and pedestrians alike. That’s the bad news. 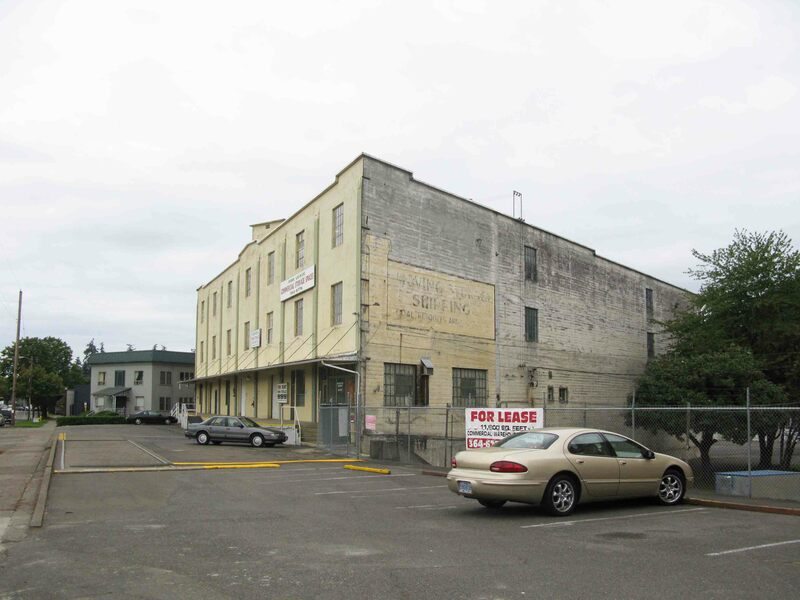 The good news is that the city of Salem has $240 million dollars to redevelop the neighborhood over the next 30 years and the neighborhood is being designated as an Urban Renewal District. 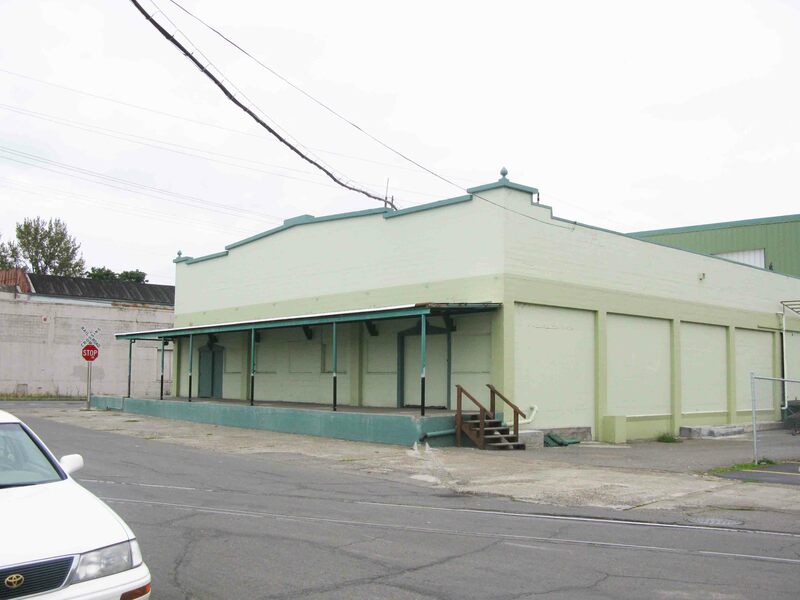 The new designation as a URD means that the city’s new goal is to redevelop the neighborhood so that it will be attractive to private investors and owners and can collect tax revenues to help redevelop other neighborhoods in the city. The city of Salem came to our architecture studio at the UO and asked for ideas to help them redevelop this neighborhood. We decided that we wanted to make this a major part of our studio experience and we volunteered to design redevelopment schemes to help the city explore viable possibilities. 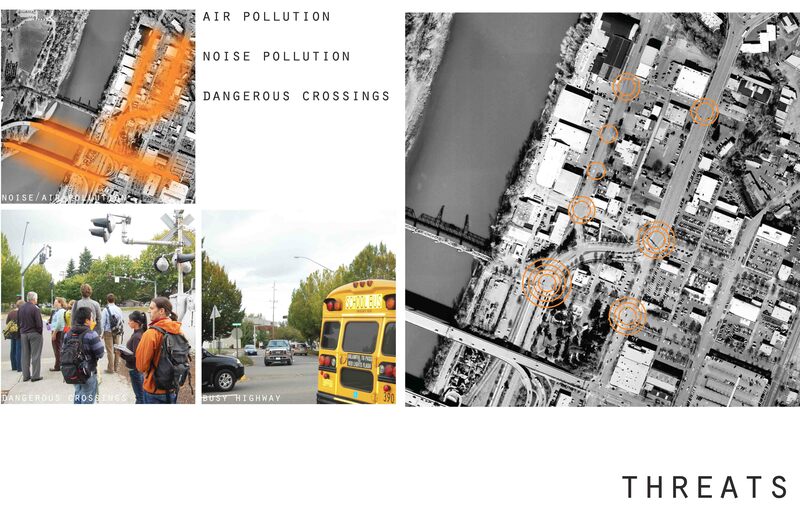 We began with an intensive analysis of the sight (the North Downtown Neighborhood). The site has some major strengths. 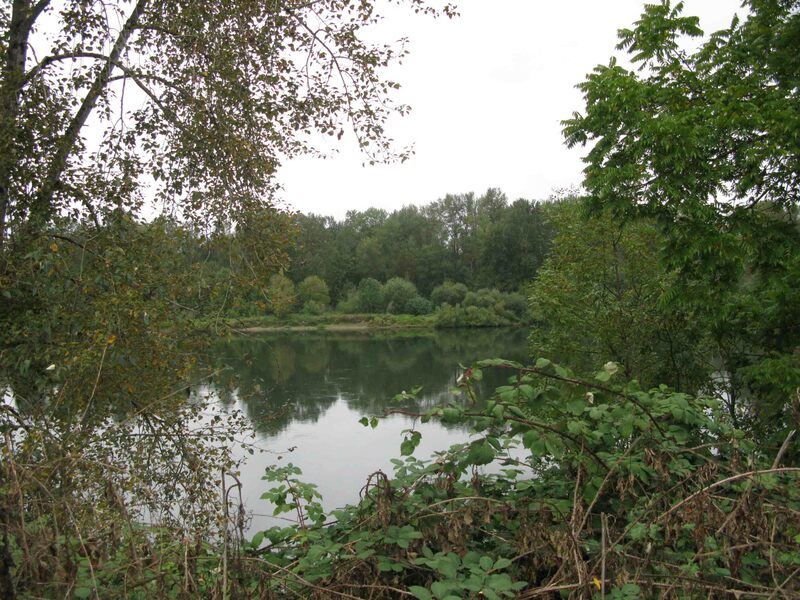 First and foremost the site borders the beautiful Willamette river on the West side. Currently all access to the river from the site is blocked or obscured by industrial facilities or old warehouses (located here because the industrial sector used to be commercially serviced from the river). 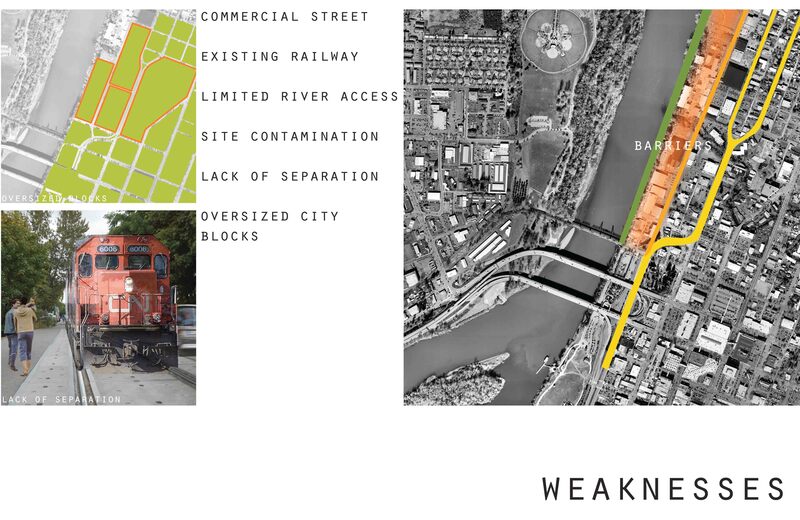 The picture above gives an idea of the the neighborhood’s current visible access to the Willamette river. As a group, we saw increasing access to the river as a major potential for redeveloping the site. The site also has a beautiful historic creek running through it. Mill Creek is so named because it was the historical means of running flour and wood mills in early-industrial Salem. Mill Creek runs from the far East end of town and spills into the Willamette river at the North-West corner of the site. I saw the joining of these two beautiful waterways as a key location to celebrate on the site. The image above is a view of Mill Creek from the Commercial Street bridge. 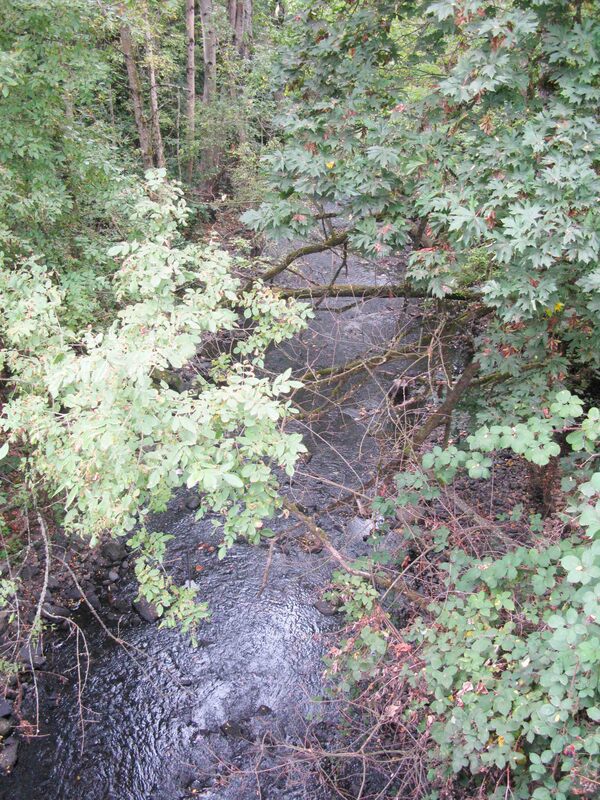 Mill Creek is a registered salmon-spawning waterway and is protected by federal regulations. Maintaining ecological viability of the creek was a major concern while redesigning the neighborhood. 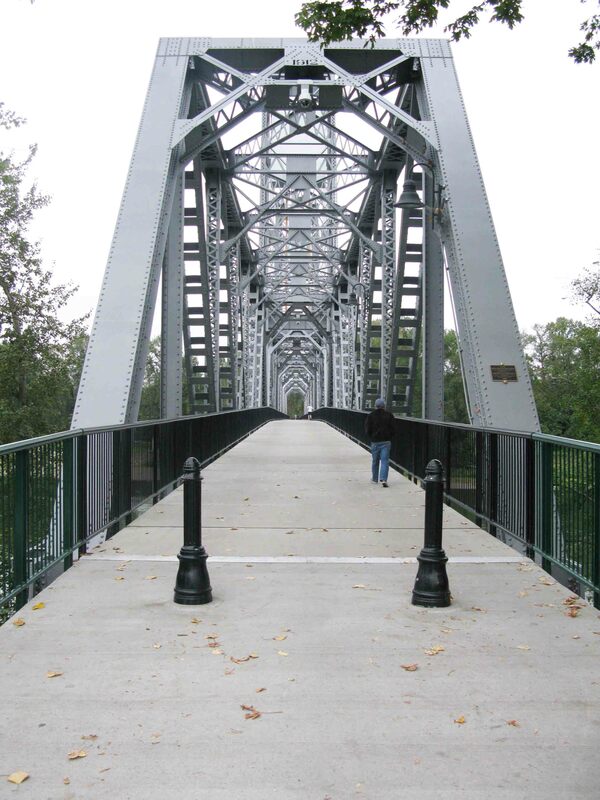 The neighborhood also has a beautiful pedestrian bridge connecting the site to Salem’s major little-league ball park on the West side of the river. The bridge used to be a Union-Pacific railroad bridge but was gifted to the city in 2007 and has been converted into a fantastic amenity (as seen below). 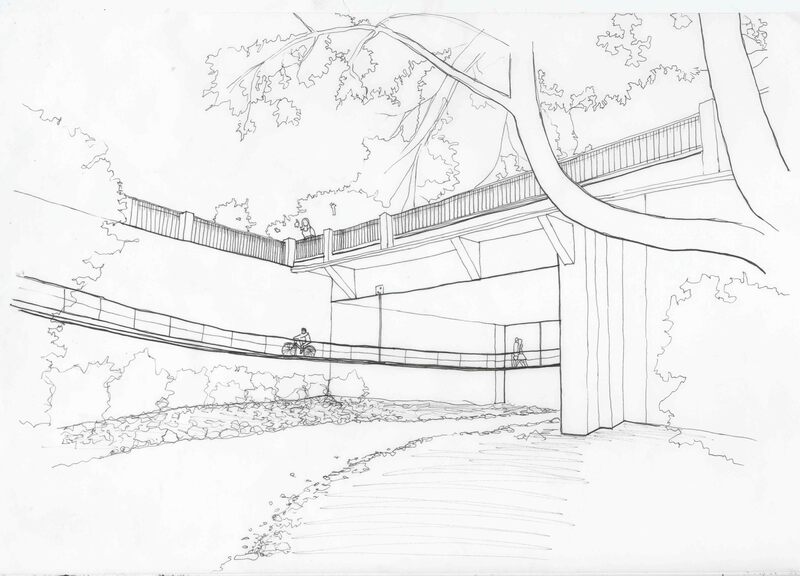 The pedestrian bridge is a wonderful gift to the neighborhood just waiting for a redevelopment to take advantage of it. 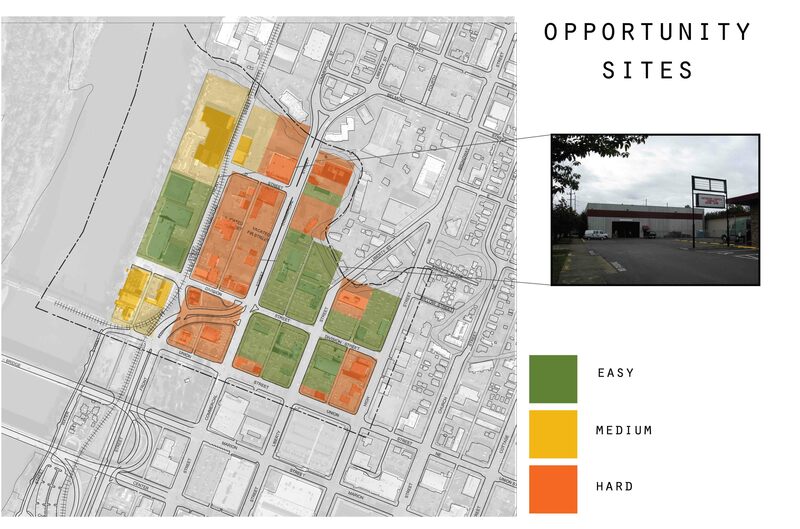 Having analyzed the site from this basic perspective, I moved into a more detailed analysis of how and where the site might start to favor redevelopment. The analysis presented above represents about 5% of the analysis done on the site for this project. Many of my colleagues contributed analysis that I used on this project, but their contributions are not presented here in this posting. Please be aware that the design decisions outlined below were made after reviewing extensive student research on the history of the site, the cultural connections to the city, typologies currently present on the site and in other parts of downtown Salem, extensive road and traffic data collected by the Oregon Department of Public Transportation, demographic and commercial data on file with the city, and the input of numerous official city planners and public policy officials. The Salem North Downtown redevelopment project was done as a group effort. All of the information presented below and on the next page was compiled with the cooperation of my colleagues Matt Brooke (who designed the Earth Bank project with me) and Alisha Snyder. The following excerpts from our stated design goals and the design work which is presented below represent only a snapshot of the design work that went into making this project possible- the totality of this undertaking could not be reasonably represented in a single blog post. This entire project went from inception to final review in a 5 week period, most of which I put well over a hundred hours into. The following work represents many long, sleepless nights and dozens of charrettes where I communicated and designed with my studio colleagues. Why the new Town Center? 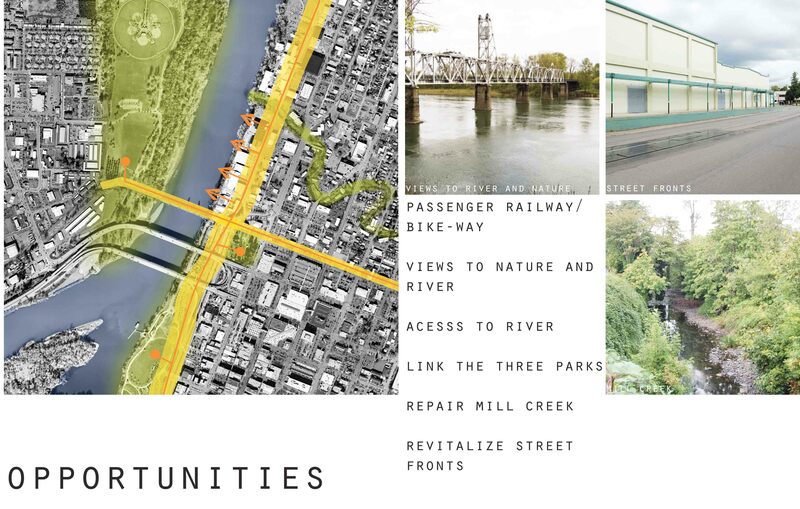 We felt that the North Downtown site was an ideal location to incorporate all of these ideas. Downtown Salem is a bustling commercial area where much of the city’s population is employed. 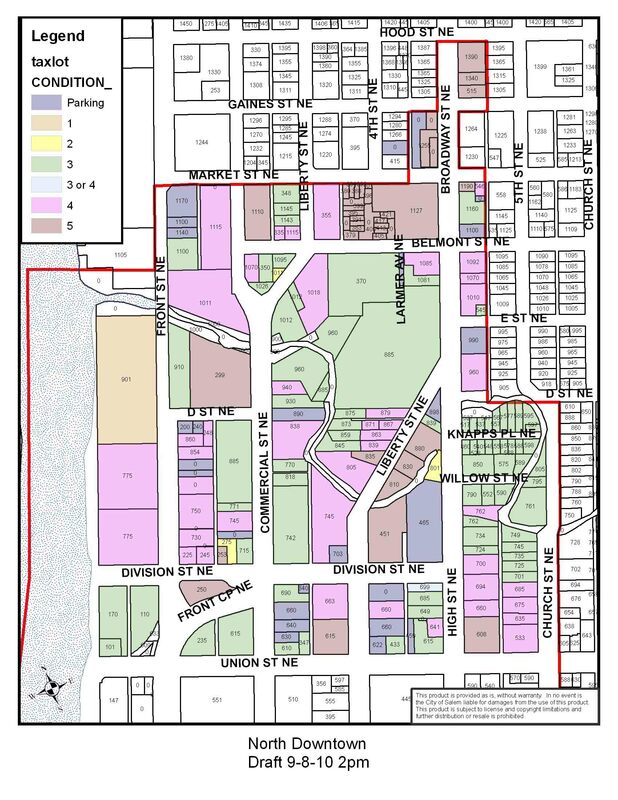 Downtown is also an historic district that is already built out to capacity. North Downtown is highly underutilized space in a prime location. 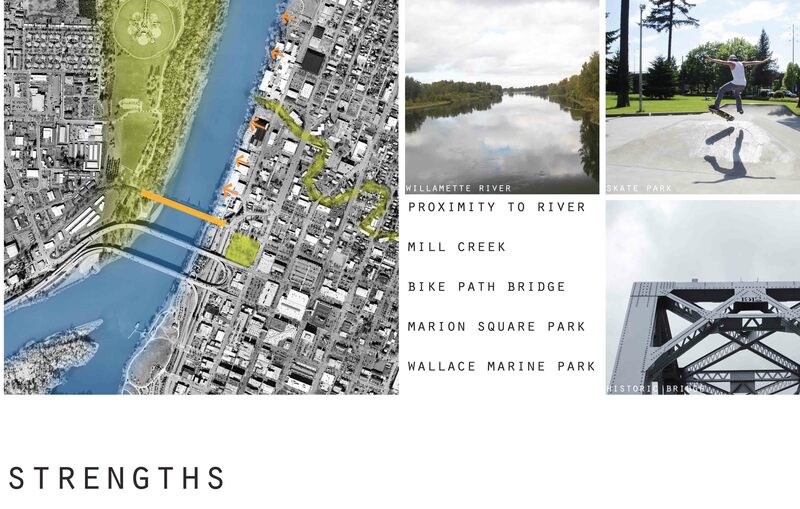 Creating public spaces such as parks and a town square are a high priority as they provide an opportunity for the public to enjoy the beauties of the Willamette River and Mill Creek within easy walking and biking distance of downtown. We felt that bringing mixed demographic housing to the site would also be a great addition. 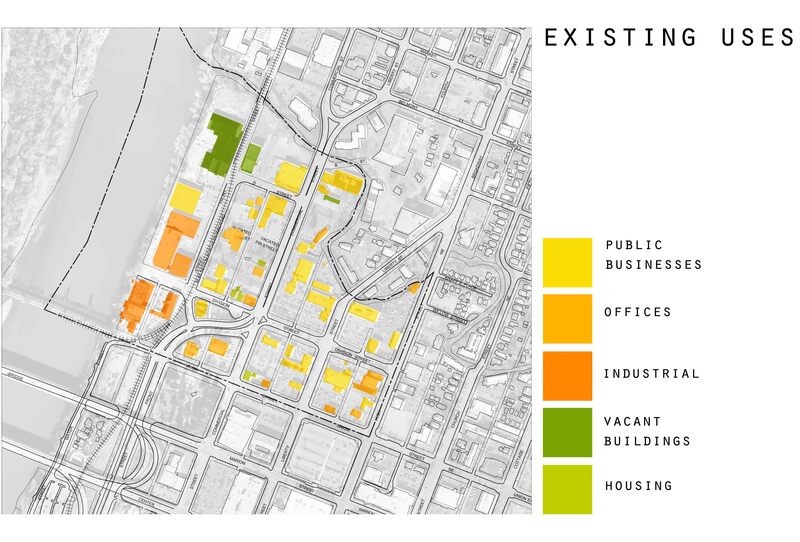 Certain waterfront sites would provide great opportunities for high-end housing that could bring large tax revenues for the city while other sites would be ideal for affordable housing. This mixture of housing types is essential to provide for the diverse needs of the people of Salem as well as to create a vibrant neighborhood. Bringing commercial use (some in the form of restaurants) to the neighborhood is very important, but must be carefully phased to meet demand. Providing a one block “Main Street” commercial core embraced at either end by a town square and park would be the ideal first phase application. Improving bike facilities is important if the city of Salem is going to work to resolve some of its sustainability issues as well as the traffic congestion problem. The North Downtown site is centrally located in the city and is a natural bike path hub. 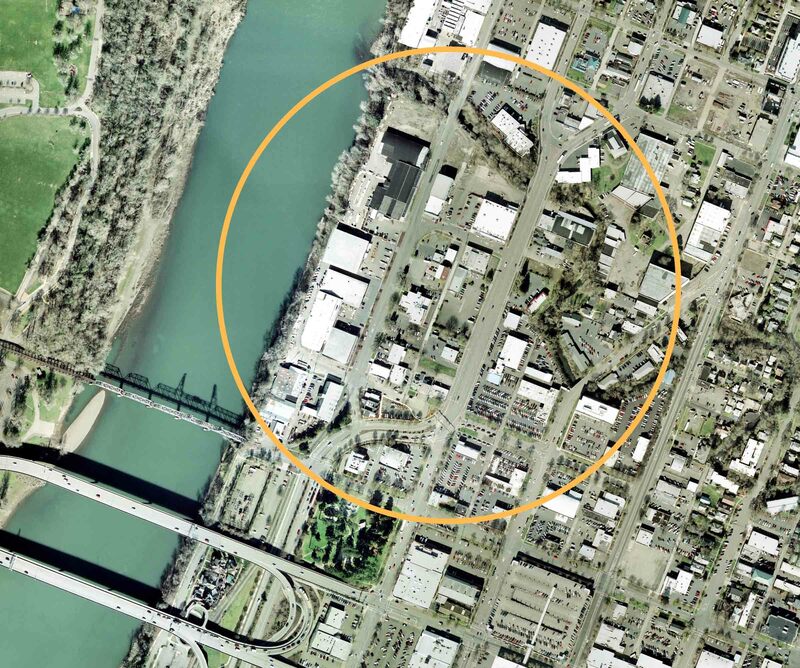 The city of Salem is embracing the idea of a more multimodal transportation plan by converting a train bridge to a bike/pedestrian bridge across the Willamette entering at the Southern edge of the North Downtown site. We hope to tie into this bike path as well as greatly expand the bike trail system all around the city. The riverfront and creekfront are ideal locations for these bike trails as they create a natural loop through the city. How my design responds to the “why”. The Town Center is conceived as a spacial and urban connection between the River and Mill Creek. In order to create a Town Center that has life and vitality, we needed to create a reason for people to be in an come to the Town Center. 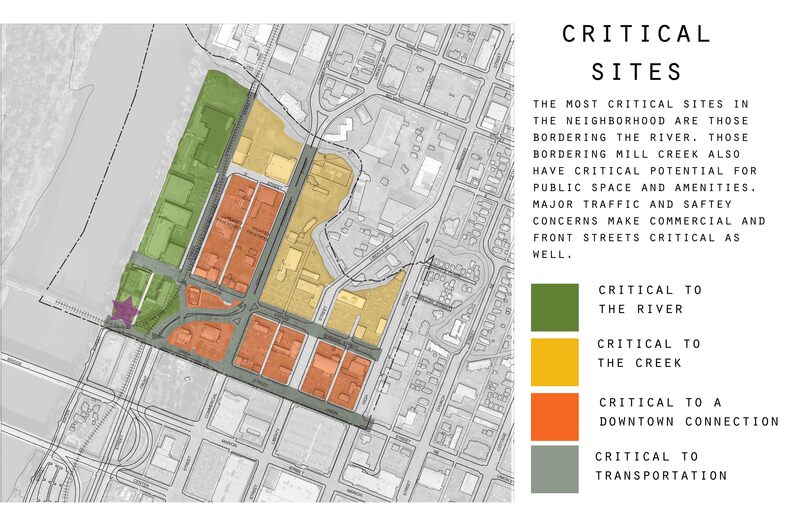 We decided to create a “core” of activity along an East/West axis that would connect the two waterways and serve as a central hub for the commercial and civic functions we wanted to bring to the neighborhood. All other programmatic functions in the neighborhood are dependent on the core of activity created by the “Town Center Axis”. In order to help support the vitality of our neighborhood, we wanted to attract a mixed demographic of residents to reside here. I included a mix of housing types ranging from low to high-income with the higher income housing being along the river and creek banks and the middle to low income mostly being concentrated in the mixed-use facilities in the central axis and along the Northern edge of the expanding downtown. Part of the vibrancy of the neighborhood was to be provided by creating a restaurant culture not currently found in Salem. We saw this as an all-hours restaurant infrastructure with morning, lunch, evening and after-hours eating establishments being attracted to the neighborhood. We saw these establishments being attracted to the “Town Center Axis” spaces and being supported by the heavy pedestrian traffic and their visual and spacial proximity to the civic spaces at either end of the axis. The “Liberty Square” which forms the East end of our axis and borders Mill Creek is surrounded by brewpubs and outdoor patio restaurants and is supported by the live music venue in the park and the views of the creek. We wanted to bring a small performing arts venue to the neighborhood to help support the restaurants and civic functions (such as a farmer’s market) that we saw in the neighborhood. We scaled this venue down to prevent it from competing with the Riverfront Park Amphitheater and and purposely placed in in Liberty Square to help it to support the businesses there. Improving the pedestrian walkability was a major part of this project. We saw the pedestrian unfriendly nature of the sight as being a major part of the negative vision the city currently has of the neighborhood. 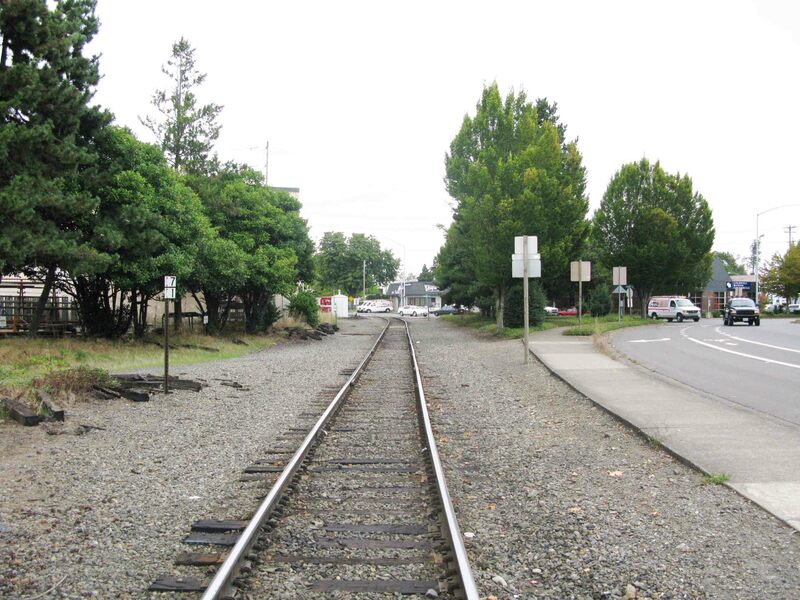 We planned to increase walkability first by creating a “Green Belt” transportation way which would connect our site to the rest of Salem and downtown and secondly by providing pedestrian infrastructure all over the site connecting all the blocks and various points of interest. We added pedestrian-friendly crossings to Commercial and Front streets and used bike lanes, on-street parking and landscaping to separate the sidewalks from the streets, allowing for a more comfortable conception of the neighborhood by those who would be occupying it. To increase the bike-friendly nature of the neighborhood we first provided the “Green Belt” commuter way for both bikes and pedestrians. We also created dedicated, separated bike lanes running North and South on Commercial street providing a direct bicycle commuter way to and from the downtown core. I also added covered bicycle parking to all of the civic spaces schemed into the plan. Please visit page 2 to view all the process and presentation work for the Salem New Town Center.